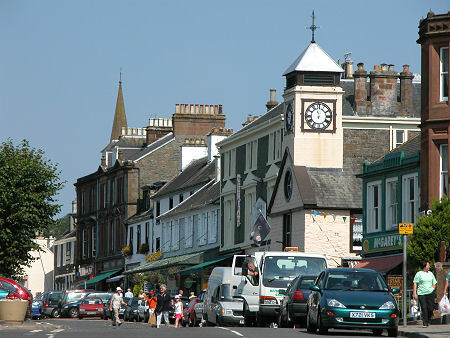 For many, Moffat is a gateway to Scotland: a first stop after crossing the border from England en route to destinations further north. 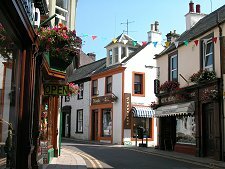 What visitors find is one of the most attractive towns in the country, offering a very wide choice of food, drink and accommodation. This also makes it a very popular stopping-off point for walkers on Scotland's longest and most challenging long distance footpath, the Southern Upland Way. Moffat's growth was built on two main elements. The first was its strategic location on one of the most obvious routes from the English Border to Central Scotland. The second was its development as Scotland's first spa resort. The origins of the town lay on the east side of today's town. 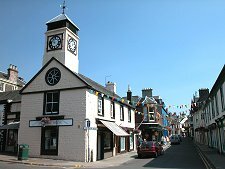 The Auldton of Moffat was the site of a church by 1177, and the signs at least two castles can still be seen on the ground, though not above it, to the east of the town. Moffat was sufficiently important to appear in the atlas published by Mercator in 1595. In the early 1600s it had grown enough to be called a town; though overland travellers still had to ford two rivers to get this far from Carlisle. In 1633 a mineral spring was found nearby, attracting those wishing to benefit from the reputed health-giving qualities of sulphurous water. A second spring was discovered in 1748, adding further to the town's fame as a spa resort. At the end of the 1700s the water of one of these springs was reported as "of a very bracing quality" and "the strongest in Britain." 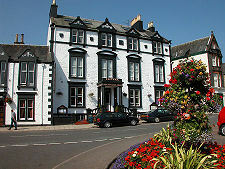 The first of the many inns and hotels still open for business in Moffat opened its doors in 1683. The Black Bull Inn (now "Hotel") was built in a prime position just to the south of the High Street on what is now Church Gate. 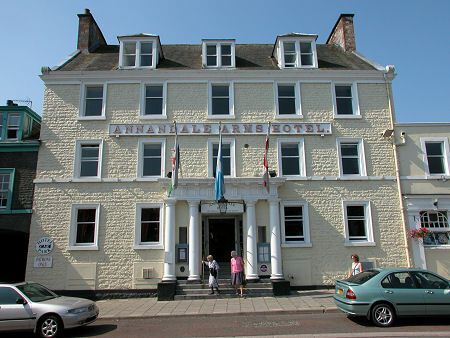 1760 saw the opening of the Annandale Arms Hotel and the nearby Buccleuch Arms Hotel, competing for the steadily growing coach traffic and the visitors to the spas. 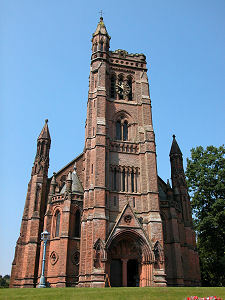 A parish church was built in 1790 opposite the Black Bull, to be replaced just 97 years later by the imposing red stone presence of St Andrew's Parish Church. 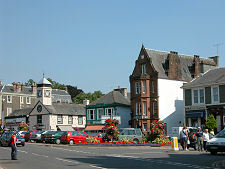 Another spa was built in the centre of Moffat in 1827. 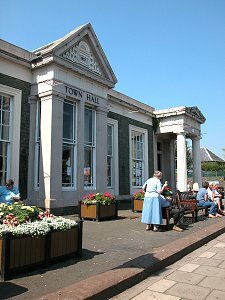 This has since been converted into the Town Hall. The main line railway arrived at Beattock, two miles away, in 1848. In 1883 a branch line opened between Beattock and Moffat itself, to take advantage of the increasing traffic generated by the large Moffat Hydropathic Hotel which had opened in 1878. The Hydropathic burned down in 1921, bringing the effective end of Moffat's life as a spa town. The railway station and branch line closed in 1954, and the station at Beattock closed in 1972. But with the coming of the age of the motor car and coach Moffat's popularity and fortunes increased still further. 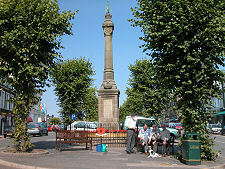 The area in the centre of the High Street, variously used as a bowling green, market place and open space, inevitably became a car park: though room was left for the impressive war memorial erected in 1920 and closely resembling a mercat cross. Today's Moffat is impressive for a number of reasons. Perhaps most striking are the large number of high quality hotels on offer in the town centre. The Annandale Arms Hotel can be highly recommended, and the Black Bull and Buccleuch Arms also feature prominently. 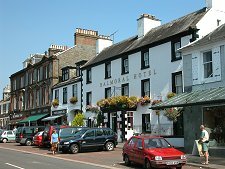 To these can be added the Balmoral Hotel on the east side of the High Street, together with the Star Hotel, proudly proclaimed to be the narrowest hotel in the UK. 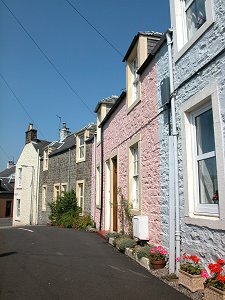 The west side of High Street offers the Stag Hotel and the Moffat House Hotel, built in 1767 as a home for the 2nd Earl of Hopetoun by the architect John Adam.